Looking for a small dog breed with a big personality? Look no further than the Australian Terrier! At only ten to eleven inches tall and twelve to fourteen pounds, the Australian Terrier has seemingly endless reserves of energy. These sweet dogs carry their ears pricked and can often be seen wagging their tail happily. This spunky little dog was the first new breed to be recognized and shown in Australia in the 1800’s. Breeders considered Australia’s own rugged climate when developing this breed. Thus, Australian terriers are nearly fearless. The affectionate spirit of the Australian Terrier usually makes them good companions for nearly any animal as long as they’re socialized early. These little dogs are fast and loving companions, and are often happy with only the companionship of their owner and may become jealous in a multi-dog home. Originally bred as rodent control and watch dogs, Australian terriers will chase after anything that moves, so they also may not be a perfect match for a surly cat already in the home. A trial run with the cat may be the best option for both pets. Their first and truest love will always be their human family, and they don’t do well when neglected. These dogs are happiest with their people! 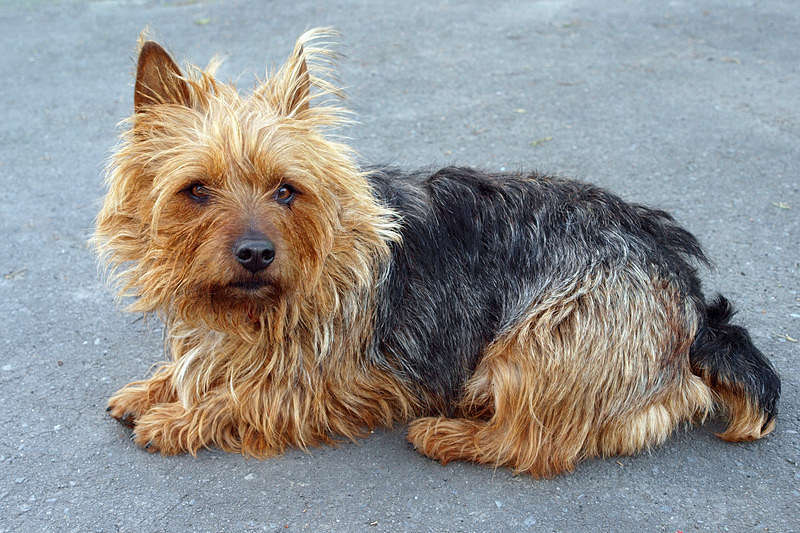 The Australian Terrier’s coat is long, rough, and wiry, which makes it sturdy and weather-resistant. It also repels water and dirt easily. As the coat has a double layer, they shed little. They also require minimal grooming, but brushing and clipping is imperative to prevent knots from forming from their intense and fun-filled play sessions. Like all dogs, regular dental care will also keep the Australian Terrier in good health and good spirits. Breeders and owners have traditionally docked the tails of Australian Terriers. However, docking is now banned in the United Kingdom. Docking the tail is unnecessary for non-working dogs who do not have to wade through thick underbrush to hunt game. Any burrs on the tail of a pet Australian Terrier through a walk in the park or forest can be easily picked off by an attentive owner, and the terrier will love the attention and grooming. Continuing the practice of docking tails may also impede their communication with other dogs and humans. The Australian Terrier is also remarkably intelligent, and they respond well to modern and humane training methods like praise and rewards, including treats and play. This breed needs moderate exercise and would be especially happy in a home with a fenced-in yard. However, like others in the terrier breed, they must be watched as they love to bark and dig holes. Channelling this energy into play time and training for obedience and agility should make this hard working dog feel right at home. Some trainers even offer herding classes, where this dog’s instincts will truly shine. The average Australian Terrier lifespan is approximately twelve to fourteen years. Like many other purebred dogs, they may develop common health problems as they grow older. Some of these complications may include diabetes, patellar dislocation, dermatitis, and Legg-Perthes Disease, which manifests as limping and pain. However, Australian Terriers have shown fewer health problems than other breeds in the terrier family due to their hardy disposition. Sound breeders will also utilize genetic testing to minimize health concerns in their future puppies. Contact a trusted and reliable breeder or a certified adoption center for more information to see if an Australian Terrier is the right fit to become a part of your family. If you welcome an Australian Terrier into your home, you will have a happy, energetic, and loving friend for life.